As a new mom, choosing to breastfeed your baby is a big decision. It’s also a big commitment but one that offers so much value to your precious baby. There are many factors that shape your choice on how you feed your baby along with some challenges. One of the challenge that women who choose breastfeeding face is how to keep up their milk supply. I’ve partnered with Kindred Bravely to bring you some tips on how to increase your milk supply so that you don’t have to worry about if your baby is getting enough to eat. Trust me, I’ve been there! When Andrew was a baby, I was able to keep up my milk supply for awhile, but for some reason, my body was producing “skim milk.” I didn’t even know that was a thing. First, the pediatrician recommended that I eat ice cream, every day, and lots of it! Yumm! But when Andrew still had a hard time gaining weight, we were told to supplement with formula. I was able to breastfeed him for 4 months and while I felt like I failed him, I also know that I did my best and that choosing to feed him however necessary, was the right decision for our family. I had the support of our pediatrician and my husband and my little guy was healthy and happy. That’s all that mattered to me. When Aidan was a baby, I thought I would give breastfeeding another shot. It was easier the second time around knowing what to expect and what worked and what didn’t. I drank a lot of water. I made sure to fuel my body with all the right foods and my milk was “normal.” But after a couple months, Aidan still wasn’t sleeping. Little did we know it would almost ONE YEAR before he would sleep more than 2 consecutive hours! And boy, was that first year rough! Unfortunately, exhaustion is one of the reasons why a mama’s milk supply can decrease. If you’re not sleeping, your body won’t produce as much milk. With the advice of our pediatrician, we were once again supplementing at 4 months old. I once again gave it my best shot but life got in the way. I felt no guilt because there was nothing I could have done differently. He had severe colic and despite my best efforts, my body just couldn’t hang in there as long as I hoped for. Here we are again on the breastfeeding journey with Avalynn (who just turned 2 months old this week!). Things are going great! She sleeps through the night or sometimes will wake up for one feeding which is a breeze! I’m eating the right foods, drinking enough water, and things are going well. However, this little girl has a HUGE appetite, so I have to work hard to keep up with her! That means sometimes waking up to pump every couple hours so that there’s always a bottle available for her in the refrigerator in case she needs a bit more. It also allows my husband to feed her sometimes so I can get enough sleep, which allows me to produce more milk for her. I’ve also been making lactation cookies and drinking Mother’s Milk Tea and I’ve had amazing results! 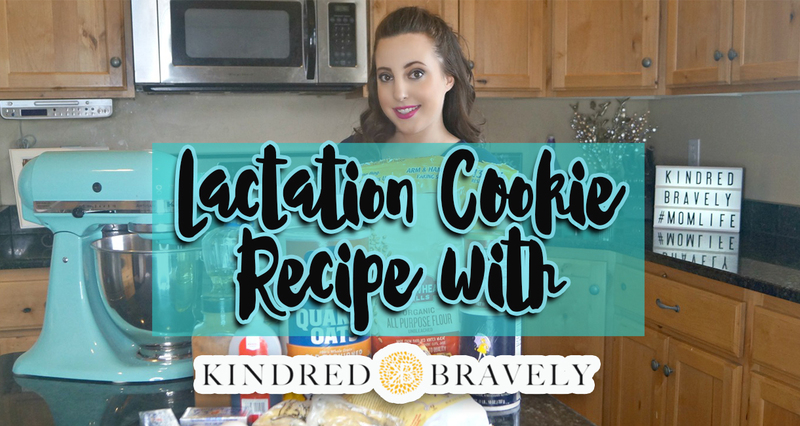 I wanted to share the lactation cookie recipe with you all because let me tell you, they are not only SUPER YUMMY, but they really work! (Your husband and kids will also enjoy them. And no, they won’t start lactating! haha) Here is the recipe and instructions below it so you can make them too! If you want to increase your milk supply naturally, these cookies will do the trick! For best (and yummiest!) results, combine with a cup of Mother’s Milk Tea! First, you’ll preheat your oven to 350 degrees. (Be sure to adjust temperature and cooking time for certain altitudes. I haven’t quite figured out how to do that but this recipe is what works for me in Utah!) Next, in a large mixing bowl, combine your dry ingredients: oats, flour, yeast, flaxseed, baking powder, baking soda, salt, and cinnamon. Then, in your Kitchenaid mixing bowl (Thanks, Mom & Dad! ), combine your oil and butter. Mix on the medium setting until it’s creamy. As you mix it, slowly add in your sugar. Continue mixing for 4 minutes until everything is fluffy. Next, add your eggs to the mixture. (It’s a bit easier to crack your eggs into a small bowl and then pour them into the mixer bowl in order to avoid any accidental pieces of egg shells.) Let the eggs mix with your butter, oil, and sugar for 4 minutes until everything is thoroughly mixed. Then, pour your vanilla extract into the mixer bowl. Reduce the speed from medium to low and slowly mix in your dry ingredients from the other mixing bowl. Once the dry ingredients are mixed in evenly, slowly pour in your chocolate chips and let them mix. You can add a few more or a bit less to your preference. Bake your cookies for 10 to 13 minutes. (Add a bit more time for higher altitude). Once you remove them from the oven, place them on a cooling rack and let cool for 10 minutes before serving. You can store your cookies in a cookie jar or an airtight container. I keep mine in meal prep containers so they are easy to grab during feedings! This awesome Cinema Lightbox is from UncommonGoods! Having a quality nursing bra is also really important! As they grow and change through the night when the milk comes in, and goes out, having not only support but also comfort is really important! We all have a bunch of those cheap nursing bras, but they don’t offer much support. Others I’ve tried are too restrictive which sometimes can lead to a clogged milk duct, which is quite painful! I received The Simply Sublime Nursing Bra from Kindred Bravely and oh my goodness, it’s a game changer! It’s by far the most comfortable nursing bra that I own and it’s super supportive! It retails for only $29 and it made of super high quality, SUPER soft nylon and spandex material. It’s available in 5 neutral colors and 4 sizes. It fits true to size and it’s seamless so no painful underwire! It also has clasps that are super easy to hook and unhook with one hand. The only thing I don’t like about it is that I didn’t have one with my first two babies. If you are currently expecting or already breastfeeding, please go buy one. You will seriously LOVE it! It’s great for day wear and sleeping and I don’t want to wear anything else! I wish you could feel how soft this is through the screen! Avalynn’s swaddle and matching bow set is from RSM Modern Design. Another breastfeeding must-have is the Simply Sublime Nursing Tank. It’s basically EXACTLY like the nursing bra above but it’s a tank. It’s SOOOO comfy, easy to use one-handed, and looks great under clothing or works to sleep in. This tank is available in black, white, or grey in 4 sizes and retails for only $35. While some mamas bounce back quickly, I’m not that lucky. So I love the way the tank sort of tucks everything in and helps with a bit of slimming while still being super comfortable. This nursing tank is a but longer so it’s hip-length and they claim that it won’t ride up. I have put that to the test and it’s true! I was really impressed. Being super short, that is often a problem that I have experienced. This tank is soooo comfy I can even sleep in it. It’s perfect for summer but also all year long as it can layer well during the colder months. Having a built in bra, rather than just an extra layer of fabric, makes a huge difference! Where was this tank all my life?! I highly recommend this to all the mamas! That cute little smile!! She is the sweetest little girl! There is something amazing about slipping into a comfy pair of maternity/nursing pajamas after a warm bath and a cup of tea! Towards the end of your pregnancy, and after your baby is born, you will likely experience difficulty sleeping. Sometimes you will choose naps over getting ready. I get it. I’ve been there. Let’s be honest, sometimes I’m still there! Having a comfy and stylish pair of pajamas helps you sleep a bit more restfully. Having something stylish to wear also makes you feel good about yourself. The Davy Nursing and Maternity Pajamas (Pants Set) does both. What’s awesome is you can wear them while you are pregnant and keep wearing them as you start nursing! So you get a LOT more use out of them! They are made from super soft, comfy fabric. I’m serious when I say that I could live in these every day if it were socially acceptable! They are available in sizes XS to XXL in 5 awesome colors and they retail for only $49 for the full set! You know what else I love about them? The shirt has two layers that come apart for easy nursing access without having to take off your top. I’m a huge fan of breastfeeding. I think it’s great for babies! (And I’m also a huge fan of “Fed is best” because life happens and we all do our best.) But I’m more modest. I would rather feed my baby in the car than out in public. Even with the third baby, this was something I’ve struggled with. Having visitors in town with a new baby means that sometimes you’ll be feeding the baby around other people. I love the idea of modest nursing pajamas that allow you to feed your baby without having to completely disrobe like a Victoria’s Secret model because yeah, there are no Victoria’s Secret models in this house! Combining comfort, style, and functionality is HUGE and a new pair of comfy pajamas is a perfect gift for a new mom! I absolutely LOVE these pajamas and highly recommend them! I think they also make a great gift for an expecting or new mom! She loves to look at her friend, the ceiling fan! The way I see it, as moms, we’ve got to stick together. We’re family now. We have the same struggles and the same desires. Which is what the Kindred stands for. And Bravely? Well, being a mom can be tough. It’s not for the fainthearted. It takes courage—bravery—to be a mom. In fact, I actually believe that each one of us is a superhero. And that’s where we come in. Because our clothes have been meticulously designed to make your superhero journey easier. Like motherhood, this company is built on love. And that love has literally been poured into each item of clothing in our line. . (Hey, I even personally hand-pick the fabrics at the factory myself to ensure you get the softest, prettiest and most durable gear out there). I hope you can feel the difference. Kindred Bravely encourages mothers to find what makes them brave and embrace the love and courage that comes with motherhood. Because sometimes it is hard. Very hard. But it’s the most important thing you will ever do. And it’s so worth it! For me personally, I look at my gift of motherhood in complete amazement! The fact that I have any children at all is a complete miracle. I have Stage 4 Endometriosis and I was told by 6, yes SIX, doctors that I would never be able to have children of my own after two surgeries (that revealed a ton of scar tissue) and several rounds of injections called Depot Lupron. At the young age of 16 was the first time a doctor told me that I should have a hysterectomy! What?! I was still a child! I knew I wanted a family of my own so I didn’t listen. I also lived in a small town at the time and had a feeling that doctors in bigger cities would be much more knowledgeable. When I moved to a bigger city at age 17, I went through several doctors who, much to my disappointment, all said the same thing! I didn’t have all the answers, but I knew I definitely wanted to have children of my own. So I did what any stubborn girl would do and I ignored the doctors’ advice. I continued to pray and trust that God had a plan for my life…. And HE did! At age 27, I finally became a mommy to the most perfect little baby named Andrew. I couldn’t believe that he was mine forever! And 19 months later, my husband and I welcomed our second little boy, Aidan who was just as sweet and amazing! Two months ago, we added their baby sister, Avalynn, to our family just before I turned 32. I can’t believe I have THREE children of my own! My pregnancy with Avalynn was difficult in ways that I never imaged. There were even some times I wasn’t sure if I would survive it, but I did. God kept me safe and he blessed us with a perfectly healthy baby girl. I don’t have all the answers. Even with three babies, I’m still learning more about motherhood every day. But what makes me brave is that I didn’t take No for an answer. I pushed through and didn’t give up no matter what. Multiple surgeries, injections, experimental medication that caused horrible side effects, and rotating through several doctors until I found one that supported my dream of becoming a mom was what it took for me to get to where I am. I survived though 10 years of physical and emotional difficulties. And then I survived three difficult pregnancies. And now, three sweet babies call me mommy. There is nothing in the world I wouldn’t do for this gift! The thing about being brave is that, eventually, you get what you deserve. And it’s worth everything. And I’m so glad that companies like Kindred Bravely exist, to support mothers through this journey, in solidarity, and provide us with things that make those little difficulties just a little bit easier and more comfortable. Because we deserve it! on Instagram, Facebook, and Pinterest! Share your #BeBravely Story in the Comments! FTC Disclosure: This post was sponsored by Kindred Bravely. I received complimentary items to facilitate my review. All thoughts are my own! I choose to only share brands and products that I actually use and love in order to bring you the best of the best! This post may contain affiliate links. That means that if you choose to make a purchase through my links, I may receive a small commission at no additional cost to you. Thanks for supporting this blog and helping me bring you more great content!